This luxurious Florida vacation home with its own large private heatable south facing swimming pool overlooking a beautiful lake is located in the small tranquil community of Westminster Gardens. 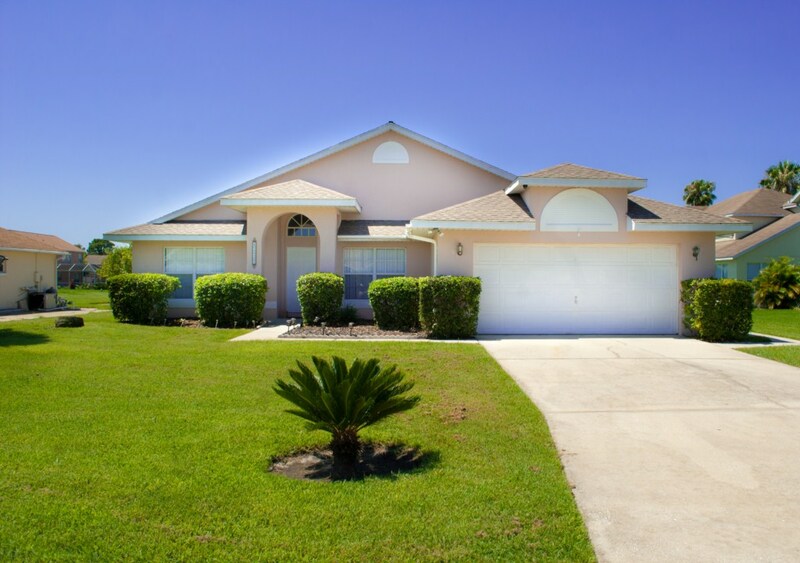 Situated in Kissimmee and just 20 minutes from Disney, via Osceola Parkway. 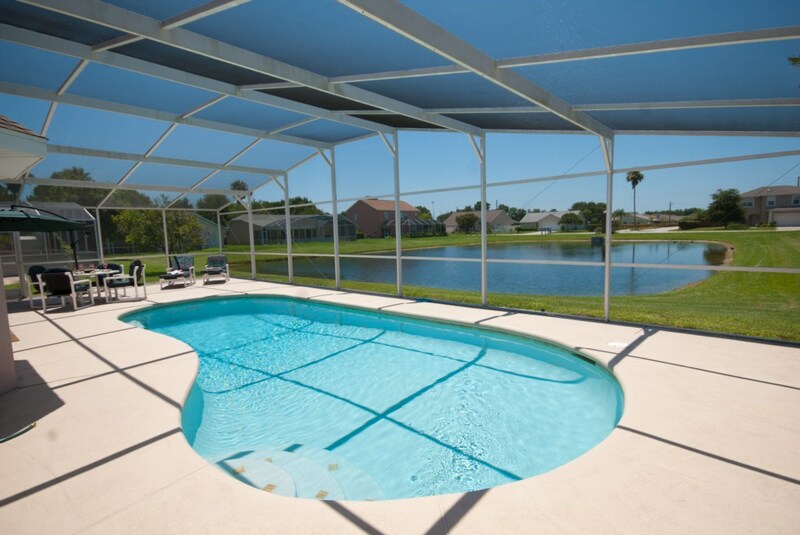 A great location from which to base your dream vacation in Orlando. Your family will love being only minutes from Disney and all the other major attractions. Shops and restaurants within walking distance of the fabulous property. Just a 20 minute drive to International Drive and Universal via the Florida Turnpike. For novice and experienced golfers Kissimmee Bay Golf Course is just a short walk away. With many other golf courses in the surrounding areas, you will be spoilt for choice! 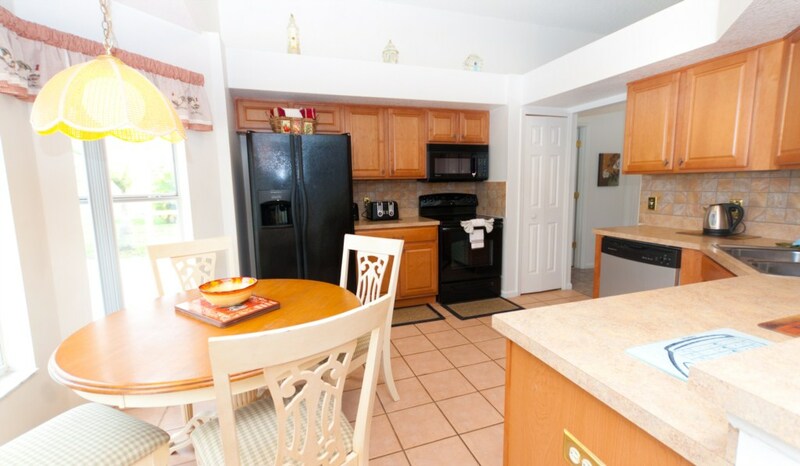 The perfect vacation home in the ideal location for your dream Disney vacation.. This beautifully furnished luxurious fully airconditioned vacation rental lakeview property sleeps up to 8 people. There is no better place to enjoy a relaxing vacation and to create memories that will last a lifetime! With three bedrooms and two bathrooms, an ideal property for a great vacation. Consisting of a king master suite, with cable TV, a stunning lakeview and a ensuite bathroom with shower. 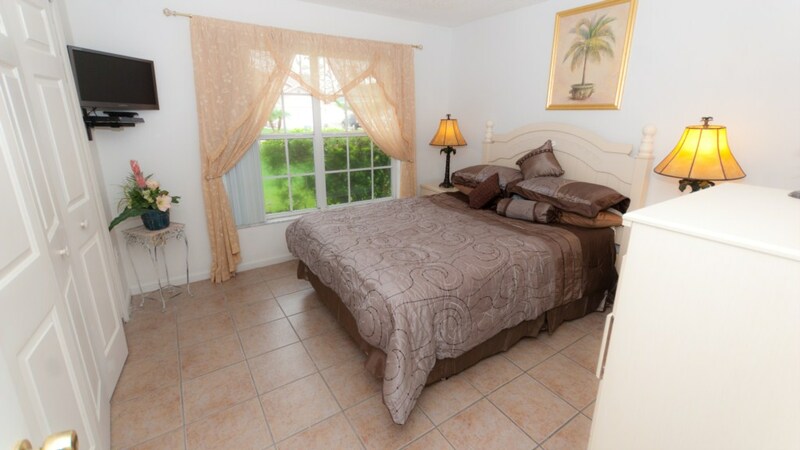 Additional sleeping accommodation includes a queen bedroom with Cable TV and a twin bedded room, all furnished in a comfortable, traditional Floridian style. Spacious family areas with plenty of comfortable seating and a large TV for all the family to enjoy. A fully equipped kitchen with breakfast nook, overlooking the pool area is the ideal setting for breakfast and snacks. The formal dining area with it's elegant table is perfect for those special meals. Super fast internet access via PC or a wireless router if you prefer to bring your own laptop. With I Pod docking station and Wi-Fi for PSP gamers. 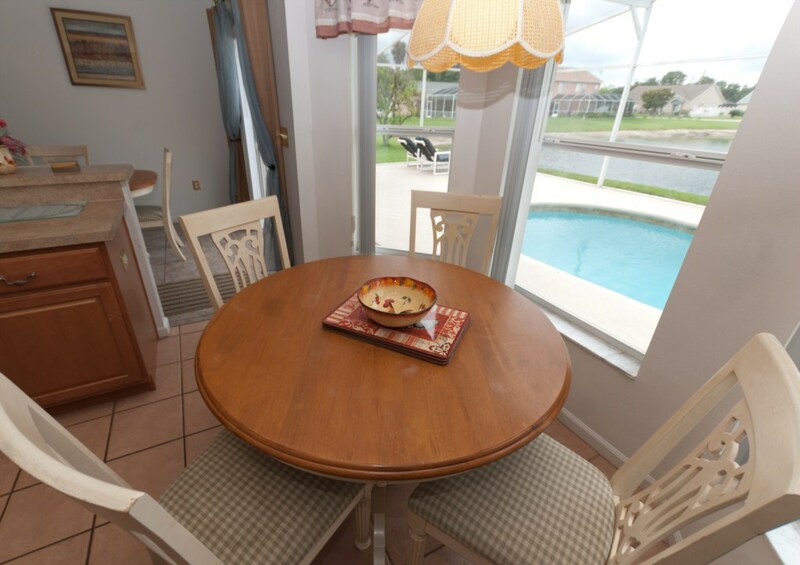 Enjoy time by the large fully screened pool with extended pool deck overlooking the lake, where you can enjoy the natural Florida, with it's many species of birds, before heading out for a busy day at one of the Theme Parks. Comfortable Palm Casual loungers and a patio set are ideal for al fresco meals and cocktails. The perfect place in the sun to relax with your family and friends. We look forward to welcoming you to our luxurious home. Located in the tranquil private residential community of Westminster Gardens in Kissimmee this beautiful home backs onto a stunning lake. Ideally situated less than one mile from Highway 192 and with easy access to Walt Disney World in just 20 minutes via Osceola Parkway. Just 15 minutes from Orlando Airport and a 50 minute drive from Sanford Airport. International Drive and Universal Parks in less than 20 minutes via the Florida Turnpike and with easy access to the dramatic Atlantic coast and the stunning Gulf Beaches. Local supermarket and chinese restaurant within walking distance. The Loop and Florida Mall shopping malls with a huge selection of shops and restaurants are just a short drive away. 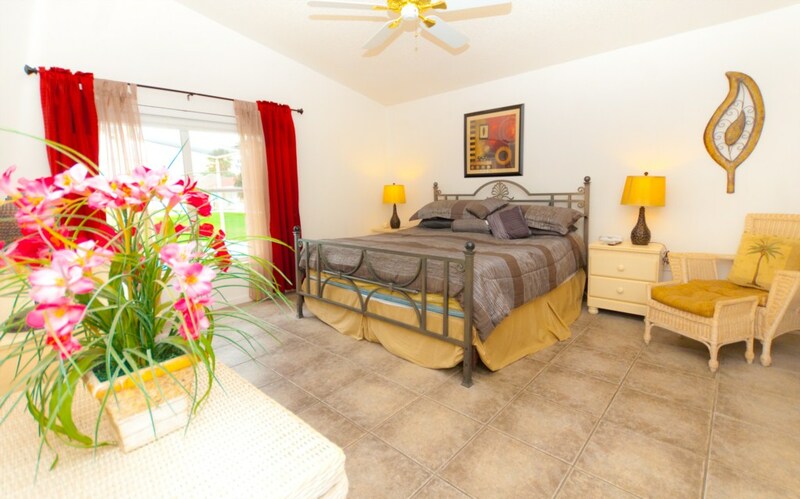 Walking distance to Kissimmee Bay Golf course and an easy drive to numerous other golf courses. A great location to base your Disney location. Thanks you for the rental of your villa. It is a lovely villa and you have provided everything anyone needs. It was a shame that only two us went . It was in the perfect location for us, as my husband was golfing most days. We loved the villa, fantastic location-such a quiet neighborhood. The house was spacious , clean and well maintained. The screened pool was a hit with the children and adults. We liked steak n shake and cic's pizza both really affordable restaurants that we don't have up north. Thank you so much, we can't wait to come back. Have stayed in villa several times over the last few years , Always been well looked after with many upgrades . Villa kept in excellent condition and only five minutes walk to local shops and supermarkets . Historic Downtown Kissimmee with its shops, cafes and restaurants is worth a visit. We had a very pleasant stay at the villa. The house and pool area were very nice and clean. We had a great time at Disney. Universal and Sea world was excellent, Harry Potter the best. We ate several times at the Cheesecake factory at the Mall of Millennia, and can highly recommend it. Thanks you for the use of the villa. Siri, asmund, Rakel, Conrad and Sir Irene from bergen, Norway.